A CENTURY AGO the Bronfmann's in Canada began laying the foundation of their booze empire, writes Tom Bruce-Gardyne for WhiskyInvestDirect. It became, in time, the Seagram Corporation with its flagship blend, Chivas Regal. But as Americans embraced Prohibition in 1919, the family first prepared to supply them with raw alcohol dressed up as whisky. A galvanised tank, lined with oak, was filled with distilled water, ethanol, sulphuric acid and some caramel for colour. The acid ate into the wood to give a semblance of cask aging in two or three days. After a botched first attempt that turned purple, the Bronfmann's were soon pumping 'Parker's Old Irish', the famous 'Glen Levitt' and the ever-popular 'Jonny Walker' across the border. What goes around comes around, and today Chivas Regal – now owned by Pernod Ricard – is among the world's most counterfeited whisky brands along with arch-rival, Diageo's Johnnie Walker Black Label. 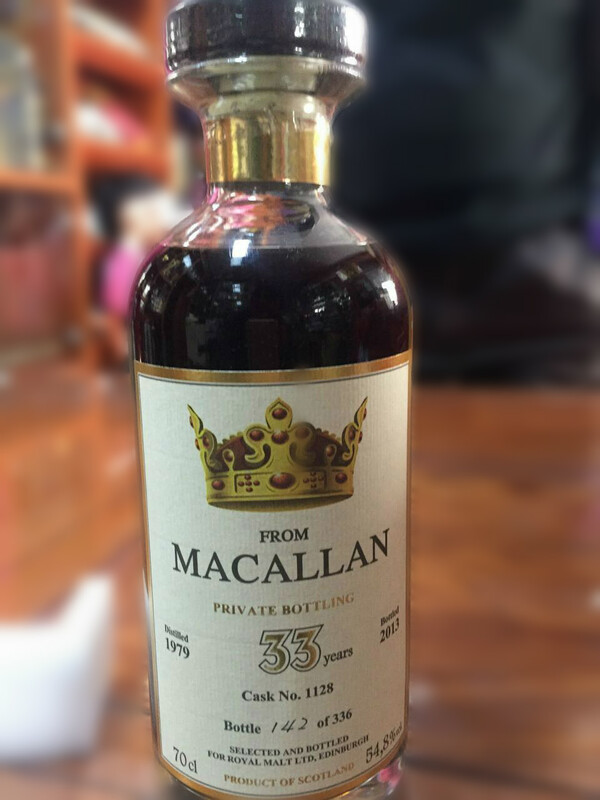 A counterfeit Macallan sold in China. Fakes are today a big issue for Scotch in fast-growing, emerging markets like India and China, where the scam might still involve a steel tank and some acid but the crooks are also more sophisticated. There are said to be 12 million litres of counterfeit whisky in Thailand, while Brown-Forman – maker of Jack Daniels bourbon – estimates that 30% of all alcoholic drink in China is fake. The distillers are fighting back with encrypted bottle codes, 'tamper-proof' closures and the latest technology using Raman spectroscopy developed by St.Andrew's University. Chinese consumers new to whisky risk being easily duped, especially if they mix it with sweet, green tea. Across in India, empty whisky bottles continue to be traded by bottle wallas, refilling their favourite – Johnnie Walker Black – many times with ever lower grade hooch until the famous label finally disintegrates. Yet ripping off brands is just one side of the story. There is also a flood of generic fakes that preoccupy industry guardians the Scotch Whisky Association and their team of lawyers. The SWA's Edinburgh HQ has a rogue's gallery of wannabe whiskies with a cast of bagpipers, Clan chiefs and glens you have never heard of. Examples include the Chivas-like Viagra Royal, and Grant's Regal Deluxe, which boasts of "its complex excellence" – an unlikely claim since it comes in a can. Reported to the SWA by a German businessman in Iraq, it was traced to Austria where the crooks were caught, having sold an estimated 15 million cans in Turkey and the Middle East. At the opposite end of the scale by volume, meanwhile, top-end forgeries also seek to fool the new breed of whisky collector and investor. Italy, where the word for fraud is the glamorous-sounding 'sofisticazione', has now been a key source for a decade apparently. The surge in counterfeit bottles simply reflects the surge in value for rare whiskies, just like wine where auctioneers haven't always been as diligent as they might have been. In 1985 Christies sold the infamous Thomas Jefferson claret for a record-breaking £105,000, apparently found in a bricked-up cellar where the future US president lived when ambassador to Paris in 1785. It was later revealed the 'ThJ' initials scratched onto the bottle were almost certainly engraved with a modern dentist drill. More recently Rudy Kurniawan was convicted by a New York court in 2014 of selling more than US$20 million worth of counterfeit wine in over a decade. Writing about the case in Vanity Fair, Michael Steinberger concluded the trade was "awash with fraudulent rarities." Among single malts, fraudsters have targeted Macallan, Ardbeg, Springbank and Port Ellen in particular, because of their high prices at auction. The BBC's Fake Britain revealed in 2013 that a bottle of Macallan Private Eye – released in 1996 to mark the satirical magazine's 35th birthday – might cost you £199 when empty. But if that seemed steep, it would have gone for £1,500 when full. Offers today reach to £1,700. Would you know the real McCoy (or MacKay) if you saw, bought and then drank it? Has this market become shark-filled waters for the bottled whisky investor? "Mark my words," declared whisky writer Ian Buxton in 2011, looking at the booming price of rare Scotch, "this investment bubble will end badly and people, and whisky, are going to get hurt." Four years on, that day surely draws closer.